Everything in the pic is included. The shocks are brand new, I recently replaced them under warranty and upgraded. The springs have less than 35k on them and are the stock ones. Looking for local buyer in the SoCal area. Sorry I really want to keep it close to SoCal. I'll make sure to update this thread should that change. 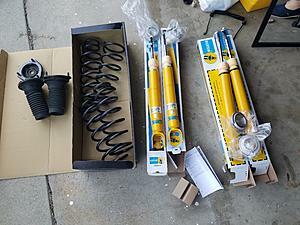 For the occassional trackday: revalved Bilstein HDs w/ tein spring or Bilstein PSS9?